Welcome to West Georgia Vision Center in LaGrange, Georgia! Dr. John Whitlow, Dr. Donna Whitlow and the West Georgia Vision Center team strive to provide the best in eye care services. We invite you to browse our website to learn more about our services, and invite you to join our patient family by scheduling an eye exam appointment with us. West Georgia Vision Center is a full service eye and vision care provider and will take both eye emergencies as well as scheduled appointments. Patients throughout the west Georgia and east Alabama area come to our office because they know they will receive the personal attention and professional care that is our foundation. Drs. Whitlow and our team are dedicated to keeping our patients pleased and well-informed at all times; we strive to explain every exam and procedure and answer all of our patient's questions. Additionally, at West Georgia Vision Center, we will work with medical and vision insurance providers to ensure good eye health and vision care for all of our patients. Our one-on-one approach to providing eye care makes Dr. Whitlow and the West Georgia Vision Center staff the eye and vision care providers of choice in the area. We offer the following services: complete eye exams, contact lenses, glasses, glaucoma testing, cataract evaluation, treatment of eye infections and injuries, and pre- and post-operative care. For a complete list of services, visit our services page. At West Georgia Vision Center, we are dedicated to providing high-quality eye care services in a friendly and professional environment. Call us at 706-882-0616 to schedule an appointment today. Diabetes can affect your eyes. Visit the National Diabetic Information Clearinghouse for more information on staying healthy with diabetes. 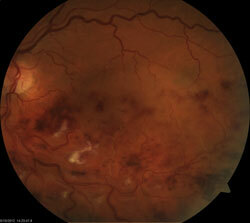 The American Optometric Association has information on diabetic retinopathy (eye damage from diabetes). At West Georgia Vision Center, we value your time. In an effort to save you time in our office, you can download and complete our patient form(s) prior to your appointment. "Highly recommended for all of your eye care needs. From sunglasses to your prescriptions! Awesome people! Absolutely the best in town!" "Dr. Whitlow has been my doctor since he first opened his practice. Always thorough, helpful, friendly, professional. My husband and my daughter use him as well. Highly recommend." "I've never had good luck with the first doctor chosen in a new place, but we hit the jackpot with Dr. Whitlow! So thankful for their cheerful staff and a doc with personality. Looking forward to next year's exams!"